Who's banned from entering the U.S. when Trump travel ban goes into effect? WASHINGTON -- What is a bona fide relationship and why does it matter? It's the basis for the implementation of the president's travel ban, and after the Supreme Court's ruling that the ban can be partially enforced, the Trump administration has set new criteria for visa applicants from six mainly Muslim nations and all refugees that require a "close" family or business tie to the United States. The new rules took effect at 8 p.m. ET Thursday following the State Department sending a cable to all U.S. embassies and consulates late Wednesday, which was obtained first by The Associated Press. Who qualifies as "close" family? A parent, a spouse, child or sibling. According to the New York Times, this also includes step siblings. Visas that have already been approved will not be revoked, but instructions issued by the State Department say new applicants from Syria, Sudan, Somalia, Libya, Iran and Yemen must prove a relationship with a parent, spouse, child, adult son or daughter, son-in-law, daughter-in-law or sibling already in the United States to be eligible. The same requirement, with some exceptions, holds for would-be refugees from all nations who are still awaiting approval for admission to the U.S.
Who's not considered "close" family? Grandparents, grandchildren, aunts, uncles, nieces, nephews, cousins, brothers-in-law and sisters-in-law, fiancees or other extended family members are not considered to be close relationships, according to the guidelines issued in the cable. The cable's language "closely mirrored the Supreme Court's order on the travel ban, though it appeared to interpret it in a narrow manner, notably in its definition of close family," according to Reuters. "It was unclear Wednesday evening whether the State Department's interpretation of the court's order would spark further legal action by opponents of the ban." Omar Jadwat, director of the ACLU's Immigrants' Rights, remarked to the AP that, "Initial reports suggest that the government may try to unilaterally expand the scope of the ban - for example, by arbitrarily refusing to treat certain categories of familial relationships as "bona fide." These reports are deeply concerning. We are watching for official word." What will qualify as "bona fide" business ties? The State Department says that a close relationship must be "formal, documented and formed in the ordinary course, rather than for the purpose of evading" the ban. The ban may also not apply to people who have "previously established" or "significant business" contacts with the U.S. Journalists, students, workers or lecturers who have valid invitations or employment contracts in the U.S. would be exempt from the ban. People who are traveling with a recognized international organization or the U.S. government will also be allowed to travel to the U.S. Visas that have already been approved reportedly will not be revoked. What doesn't qualify as a "bona fide" business tie? The exemption does not apply to those who seek a relationship with an American business or educational institution purely for the purpose of avoiding the rules, the cable said. A hotel reservation or car rental contract, even if it was pre-paid, would also not count, it said. Refugees who are in transit through July 6 will be admitted, senior administration officials said Thursday. After that, they will be assessed according to the new guidelines laid out in the executive order. The officials also told reporters that a resettlement agency that provided a formal assurance will not be considered sufficient to prove a bona fide relationship. Consular officers may grant other exemptions to applicants from the six nations if they have "previously established significant contacts with the United States"; ''significant business or professional obligations" in the U.S.; if they are an infant, adopted child or in need of urgent medical care; if they are traveling for business with a recognized international organization or the U.S. government or if they are a legal resident of Canada who applies for a visa in Canada, according to the cable. Critics said they are watching closely to see how the guidelines are used. On Monday, the Supreme Court partially lifted lower court injunctions against Mr. Trump's executive order that had temporarily banned visas for citizens of the six countries. The justices' ruling exempted applicants from the ban if they could prove a "bona fide relationship" with a U.S. person or entity, but the court offered only broad guidelines -- suggesting they would include a relative, job offer or invitation to lecture in the U.S. -- as to how that should be defined. Senior officials from the departments of State, Justice and Homeland Security had labored since the decision to clarify the ruling and Wednesday's instructions were the result. The new guidance will remain in place until the Supreme Court issues a final ruling on the matter. Arguments before the justices won't be held until at least October, so the interim rules will remain in place at least until the fall. Shortly after taking office, Mr. Trump ordered the refugee ban and a travel ban affecting the six countries, plus Iraq. He said it was needed to protect the U.S. from terrorists, but opponents said it was unfairly harsh and was intended to meet his campaign promise to keep Muslims out of the United States. After a federal judge struck down the bans, Mr. Trump signed a revised order intended to overcome legal hurdles. That was also struck down by lower courts, but the Supreme Court's action Monday partially reinstated it. 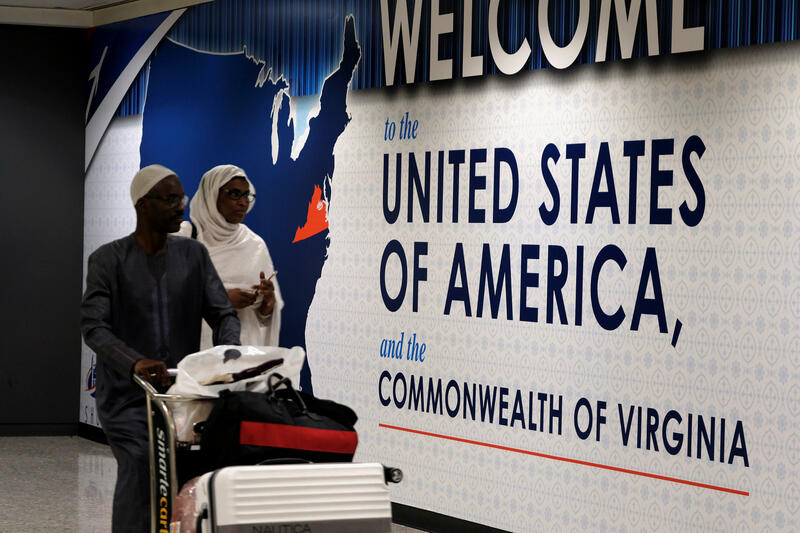 The initial travel ban led to chaos at airports around the world, but because the guidelines exempt previously issued visas, similar problems are not expected. After a judge blocked the original ban, Mr. Trump issued a scaled-down order and the court's action Monday further reduced the number of people who would be covered by it. Also, while the initial order took effect immediately, adding to the confusion, this one was delayed 72 hours after the court's ruling. Under the new rules, would-be immigrants from the six countries who won a coveted visa in the government's diversity lottery -- a program that randomly awards 50,000 green cards annually to people from countries with low rates of immigration to the United States -- will also have to prove they have a "bona fide relationship" with in the U.S. or are eligible for another waiver or face being banned for at least 90 days. That hurdle may be a difficult one for those immigrants to overcome, as many visa lottery winners don't have relatives in the U.S. or jobs in advance of arriving in the country. Generally, winners in the diversity lottery only need prove they were born in an eligible county and have completed high school or have at least two years of work experience in an occupation that requires at least two other years of training or experience.